Patrick Henry Reason was one of the few commercially active black engravers of the 1830’s and 40’s. He was the brother of Charles Reason , teacher and principal for a time at the Institute of Colored Youth. 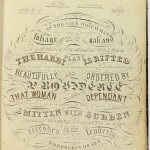 Patrick contributed a stunningly calligraphed version of Washington Irving’s poem, “The Wife”, elegantly curved and shaded to appear as an elaborate engraving. Brother Charles contributed a poem on “True Happiness”. Click the images below to explore Patrick Henry Reason’s contributions.